During the third act, and while there was a temporary pause for one of the actors to enter, a sharp report of a pistol was heard, which merely attracted attention, but suggesting nothing serious, until a man rushed to the front of the President’s box, waving a long dagger in his right hand, and exclaiming, “Sic semper tyrannis,” and immediately leaped from the box, which was in the second tier, to the stage beneath, and ran across to the opposite side, making his escape, amid the bewilderment of the audience, from the rear of the theatre, and mounting a horse, fled. The screams of Mrs. Lincoln first disclosed the fact to the audience that the President had been shot . . .
At about the same time, six blocks away, another would-be assassin forced his way into the home of Secretary of State William H. Seward. When the assailant’s gun misfired, he used it to bludgeon Frederick Seward, who served as an assistant secretary of state under his father, and then entered the bedroom where William was recuperating from a serious injury caused by a carriage accident the previous week. After slashing the senior Seward’s face repeatedly with a knife, the man escaped on horseback—but not before he had attacked three other men: another of Seward’s sons, a convalescing soldier working as a nurse, and a State Department messenger. Although Frederick was gravely wounded, none of the victims in the Sewards’ home died from their injuries. Before the night was over, a nationwide hunt had begun for members of the conspiracy, including the two assailants, soon identified as John Wilkes Booth and Lewis Powell (alias Payne). Secretary of the Navy Gideon Welles learned of these events moments after going to bed for the night. He rushed first to the Sewards’ home, then to the theater, and finally to the bedside of the dying President. On Tuesday, exhausted and still overwhelmed, Welles jotted down in his diary the details of the tragedy “for future use, for they are fresh in my mind and may pass away with me but cannot ever be forgotten by me.” He also described the preparations for the funeral and the jockeying for power by various officials, particularly Secretary of War Edwin Stanton, as soon as Andrew Johnson had been sworn in as the 17th President. Welles extensively emended his diary before his death in 1878, and his son published a revised version in 1911. In 1960 a new edition, which adheres closely to the original, unpolished text of Welles’s diary, appeared at last, and it is this text we present to Story of the Week readers. 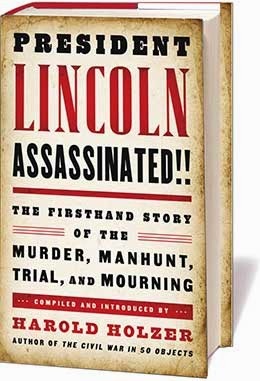 The selection is included in the newly published collection, President Lincoln Assassinated!! The Firsthand Story of the Murder, Manhunt, Trial, and Mourning, which gathers over eighty documents relating to one of the most tragic events in our nation’s history. Note: Montgomery C. Meigs, who met Welles and Stanton at the Sewards’ home the night of the assassination and accompanied them to Lincoln’s bedside, was Quartermaster General of the U.S. Army during the Civil War. I had retired to bed about half-past ten on the evening of the 14th of April, and was just getting asleep when my wife said some one was at our door. . . . If you don't see the full selection below, click here (PDF) or click here (Google Docs) to read it—free!